In the spring of 2006 a very enlightened board of directors for the Great Connecticut Traditional Jazz Festival asked me if it would be possible to assemble a youth band, using students from many different schools in the area, to perform at this summer's festival. I replied that I would love to do it if somebody could help scare up suitable participants. They put the word out and found a wonderful group of kids for me to work with, and also lined up a big air-conditioned room in a community center for us to rehearse in. We ended up with three trumpets, two reeds, two trombones, two tubas, piano, guitar, and drums. I dug up some of my old traditional jazz arrangements, and the kids loved them. We had five rehearsals on Monday nights, starting right after school got out. My experience with other youth bands had shown that you can never expect all of the kids to show up at rehearsals, but they always make it somehow to the performances. This group was no exception; they all showed up for all three performances at the festival, in spite of a colossal thunderstorm on Friday afternoon and power failure on Saturday. After their final set on Sunday several of the band members found a place to jam near the pool; I've been told that members of other bands came to join them for a spell. Apparently during that session the students and their loyal parents passed the hat; they sent a delegation into the Club House during my last set with the Galvanized Jazz Band to present me with a very generous gift to replace my wristwatch, which had been soaked during the rainstorm. In my thank-you letter I expressed gratitude for that gift, but pointed out that no timepiece could ever mean as much to me as their performances did. I am especially grateful to the parents, who were very supportive in this project; they put a lot of time and effort into getting the kids to the rehearsals and to the festival. After hearing the band, Bill Sinclair asked me if they would like to play during his band's intermission on any Friday evening at Bill's Seafood in Westbrook. On August 11 we took him up on that kind offer. Replacing the sax and piano players, who were unavailable on that date, we had two amazing young students who had participated in the Neighborhood Music School Jazz Camp in New Haven during the week after the festival; I was able to convince them to sit in without rehearsal. If you couldn't get to Bill's Seafood in Westbrook last Friday (12/8/06), you missed a FANTASTIC evening of jazz! In addition to the Bill's Seafood All-Stars (Steve Bulmer on bass, Charlie Weyant on reeds, Bill Sinclair on piano, Tom Boates on trombone) and special guest drummer Jim Oblon, seven young musicians played between sets and sat in during the second set. It was AMAZING! These young men and women give me hope for Our Kind of Music for my twilight years! All seven, with five others, participated in the first Great Connecticut Traditional Jazz Festival Youth Jazz Camp in June and July 2006 and played at the Festival in July. All seven are talented musicians. They are: Adam Clark, trombone, Emma Sayles, trombone, Emily Pecoraro, clarinet and alto sax, Julie Blum, soprano and alto sax, C J Tomasevich, trumpet, Carly Villa, tuba, and Molly Sayles, drums. Adam, Carly, and Emily are from Guilford, CJ is from Madison, and Emma and Molly are from Colchester. Julie hails from Westbrook. During their set, accompanied by "Little Billy Sinclair" on piano, the kids played tunes including "Chelsea On Down, "Bye & Bye", "Melancholy", Smokey Mokes", and "Arab Strut". Led by Art Hovey, bass and tuba player for the Galvanized and Heartbeat Jazz Bands and retired physics teacher, the band members have learned arrangements and improvisiation. Their talent showed clearly when they were called to the bandstand to sit in on "Watermelon Man", "Lester Leaps In", "Silent Night", and "C Jam Blues". It was especially fun to see the three trombones (Tom B, Emma, and Adam) playing off each other, and the three saxes (Charlie Weyant, Emily, and Julie) doing the same. All the way through Molly did a tremendous job on drums. As Charlie Weyant noted, the All-Stars are always glad to encourage young musicians. He extended an invitation, on behalf of the band, for these youngsters to return and sit in anytime. A comment overheard at Bill's: "...the best set I've heard..." It should also be noted that Bill's Seafood in Westbrook has been very supportive of young musicians and our kind of music. - On June 2 (2007) the band performed at the SHORELINE ARTS ALLIANCE SHOWCASE in Guilford. Immediately after that performance the band joined forces with members of the Community Music School Jazz Ensemble (from Centerbrook) for a jazz workshop directed by Chris and Dan Brubeck, along with guitarist Mike Dimicco and pianist Chuck Lamb. Later in the evening the students were part of the Brubeck Brothers Quartet concert, performing a big-band arrangement of Dave Brubeck's "Blue Rondo a la Turk". All of the members of our little band accepted the invitation to stand up in front of the band and take a couple of solo choruses! The confidence that they have gained during the past year by sitting in with the Bill's Seafood All-Stars was clearly evident; the Brubeck Brothers were clearly impressed, and the audience responded with a long standing ovation! - On July 18 (2007) the band performed for a very appreciative Rotary Club at Angelico's Lakehouse Restaurant in East Hampton. - The band performed Friday through Sunday (July 27-29, 2007) at the GREAT CONNECTICUT TRADITIONAL JAZZ FESTIVAL in Moodus, earning a lot of well-deserved attention and praise from other musicians as well as the general public. - Members of the band sat in at Bill's Seafood in Westbrook on August 17 and again on November 9, 2007. - On December 2 (2007) the band braved the weather to perform at the new Marlborough Arts Center. This performance was recorded by Suite Audio Studios of Clinton. - On February 24 (2008) the band provided music for Reverend Carl Christensen's 10 AM Sunday service at the Ivoryton Congregational Church, 57 Main Street in Ivoryton, Connecticut. A rousing good time was had by all. - On June 6 (2008) the Sugarfoots joined Jim Fryer and the Seafood All-Stars for another romp at Bill's Seafood . . . MAP & DIRECTIONS in Westbrook. . . PHOTOS . . .
- The band also performed at Bill's on March 28. - On Saturday, June 7 (2008) the Sugarfoot Jazz Band performed on the town green in Madison as part of the Children's Fair for the Juvenile Diabetes Research Foundation . . . . MAP & DIRECTIONS. . .
- On Sunday, June 22 (2008) members of the Sugarfoot Jazz Band performed for the first time with members of the Galvanized Jazz Band in the Essex Fire Department's 175th anniversary parade. Despite morning hail and a last-minute thunderstorm the parade went well. - The band returned to the Hot Steamed Jazz Festival in Essex on June 28, (2008) for another triumphant performance, introducing several new arrangements. Several members of the band also sat in at the jam session later that evening and impressed all of the adult musicians tremendously. 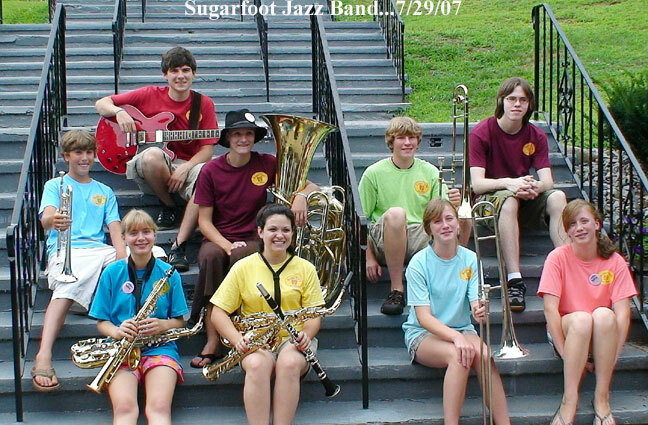 - On July 20 (2008) the Sugarfoots performed on the Guilford Green, to be joined later by a local group known as the "Galvanized Jazz Band". - Sugarfoots on TV! 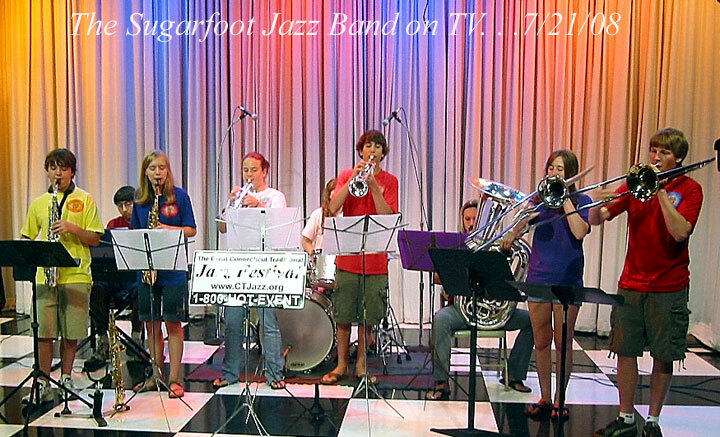 The band appeared on WFSB-TV on a Monday morning in July (2008) to help publicize the Great Connecticut Jazz Festival. - The band reached new heights at the 2008 Great Connecticut Jazz Festival, which was July 25-27 in Moodus. In addition to performing its own sets on all three days, Sugarfoot band members joined the adult bands in the monster jam session at the Grand Finale set and earned a big standing ovation. . . Marce Enright's Report. . . MORE PHOTOS . . . Jazz fans and musicians alike commented about how they heard the band playing while walking by and thought it was one of the adult bands until they saw who was onstage. - The band earned another standing ovation at Bill's Seafood on August 8 (2008) with some members rushing to Westbrook after participating in the final concert of New Haven's week-long Neighborhood Music School Jazz Intensive. - On August 14 (2008) the band gave a concert at the Stoneridge Retirement Community in Mystic. This was the farewell performance (for now) of Emily Pecoraro and Adam Clark, both charter members of the band, who are off to college. - On September 7 (2008) the Sugarfoots performed as part of the 10am Rally Day service at the Marlborough Congregational Church, 35 S. Main Street in Marlborough, CT.
- On Sunday, October 26 (2008) the band performed for a very appreciative audience in Madison at the Scranton Library, located at 801 Boston Post Road. - On November 30 2008 the band returned to the Marlborough Center for the Arts, located at 231 North Main Street, Marlborough, CT with a rousing performance for a packed house. - On December 14 (2008) the band returned to Madison for another concert at the Scranton Library, located at 801 Boston Post Road, in Madison. In addition to our traditional jazz repertoire the band introduced some new arrangements of light holiday music which was warmly received by a large and appreciative audience. - On April 18 (2009) the band performed along with the Galvanized Jazz Band and Triple Play at Mountain Ridge in Wallingford, the site of this summer's Great Connecticut Traditional Jazz Festival. This event was a special private party for potential festival sponsors. - On June 13 (2009) we performed on the town green in Madison to open the Children's Fair for the Juvenile Diabetes Research Foundation. . . . MAP & DIRECTIONS. . .
- Our third CD, pictured below, was released at the 2009 festival and sold well. Blues March . . . Black & Tan Fantasy . . . Original Dixieland One-Step . . .
or mail a check to Art Hovey, 35 Housatonic Avenue, Milford, CT 06460-3417. 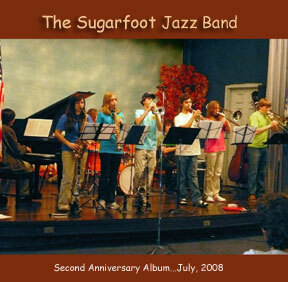 - The Sugarfoot Jazz Band was a smash hit at the 2009 Great Connecticut Traditional Jazz Festival at Mountain Ridge in Wallingford. The group won admiration and praise from members of the finest bands in the nation, and earned standing ovations from the crowds. PHOTOS . . . SLIDE SHOW . . .
- On Nov. 22 (2009) the band performed for a packed house in Madison, CT at the Scranton Library, located at 801 Boston Post Road, in Madison. - On January 1, 2010 (New Year's Day!) the Sugarfoot Jazz Band performed from 7 to 8:30 pm at Bill's Seafood in Westbrook. - On February 20 (2010) the Sugarfoot Jazz Band performed at a cabaret dinner and Mardi Gras celebration for the Women's Club at Our Lady of Fatima Parish Hall, located at 382 Hope Hill Road in Wallingford. The event was a huge success, and the band was much appreciated. - On June 12, 2010 the band returned to the town green in Madison to participate in the Children's Fair for the Juvenile Diabetes Research Foundation. MAP & DIRECTIONS. . .
- On June 26, 2010 the Sugarfoot Jazz Band performed for a large and very enthusiastic audience at the Hot Steamed Jazz Festival in Essex. - Our fourth CD, pictured below, was released at the 2010 Great CT Jazz Traditional Jazz Festival. - The Sugarfoots were a big hit at the 2010 Great CT Traditional Jazz Festival in Meriden..
- On November 23 (2010) the band performed at the Lyme Art Association, located at 90 Lyme Street in Old Lyme as the kickoff event for the association's Holiday Festival of Trees and Music, hosted by Bring Our Music Back. - On December 3 (2010) the band returned to the Marlborough Center for the Arts, located at 231 North Main Street, Marlborough, CT, performing for a large and appreciative audience as part of the organization's annual Festival of Wreaths. - On December 5, 2010 the band performed once again for a packed house in Madison, CT at the Scranton Library, located at 801 Boston Post Road, in Madison. - On June 24 and June 25 (2011) the band performed for large and very enthusiastic crowds at the Hot Steamed Jazz Festival in Essex. - On August 11, 2011 the band warmed up the stage for the Glen Hanson and Glenn Miller Orchestras at Harkness Memorial Park in Waterford, CT in a huge outdoor concert sponsored by Bring Our Music Back. The weather was perfect, the stage and sound system were amazing, and there were well over a thousand enthusiastic people in the audience right from the start. - The Sugarfoot Jazz Band re-united to perform for the 2012 Hot Steamed Jazz Festival on June 23 in Essex. On August 9, 2012 the Sugarfoot Jazz Band returned to Harkness Park in Waterford, CT, opening for the world-famous Preservation Hall Jazz Band in an outdoor concert organized by Bring Our Music Back. It was a beautiful evening and the music was wonderful. This was our final event of the summer, as most of the band members will be leaving for various colleges in the fall. A younger "Tenderfoot Jazz Band" was in the works; it became known as the "Route 17 Stompers", and it performed at the final two "Hot Steamed Jazz Festivals" in Essex in the summers of 2013 and 2014. On July 27 (2013) a small group from the Sugarfoot Jazz Band performed at the Lyme Academy's Youth Stage as part of Old Lyme's Midsummer Festival on the lawn of the Lyme Academy College of Fine Arts featuring zydeco, jazz, and blues, sponsored by Lymes' Youth Service Bureau and Bring Our Music Back, Inc.